Something a bit different today. 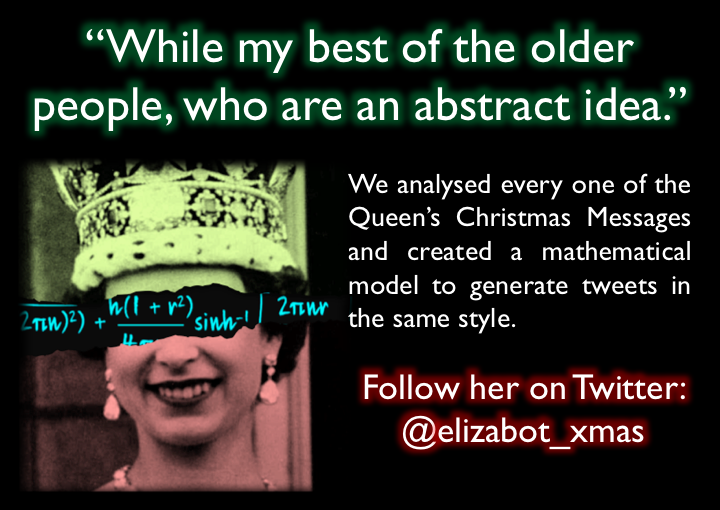 As part of the research for our book, we created a two-step Markov model to analyse the Queen’s Christmas Messages and generate tweets in the same style. We’ll be tweeting these out from now until she delivers her message (When you can test how accurate we were!). Across her 64 messages (including a written message in 1969), our Liz has actually got through a remarkably wide range of topics (with admirably little repetition, given the unvarying nature of her brief! ), so don’t be surprised if the Elizabot comes out with the occasional musing on magnets, bagpipes or football. This entry was posted in Maths and tagged advent calendar, Christmas, Christmaths, Markov Chains, Maths, The Indisputable Existence of Santa Claus on December 4, 2016 by thomas.